Interested in our initial planning for the iPads? Check it out here. All the final details and improvements can be found here. Once again, I have to thank all of the great librarians who helped me with this process. This was definitely the hardest part of the process, but it was also the most fun! Deciding on apps can be extremely overwhelming. There are so many to choose from and you don't want to waste your money on horrible ones. We decided that we wanted to lock the iPad on one app a day. This made it a bit more staff intensive by having us set it up each day, but it was definitely the right decision for our library. We have a huge issue with children staying on the AWE computers way over our time limit. Then, when parents make them leave they throw huge fits. We wanted to avoid this at all costs with the iPads. We really wanted it to be an item that was interesting for about 10-15 minutes, and then they would move on to something else. I started by going to the Darien Library website and pouring over all of their resources. I then went back to Kelsey over at Library Bonanza and begged her for her list of apps. A similar begging email went out to about 5 other librarians. Once I had all of this data compiled, I went through the list and looked up each app on the iTunes store. I didn't want to be stuck with apps I hated, so I tried to do as much research as possible before actually buying them. Sometimes though, it was still hard to tell if it would work for us, and I just took a chance and bought it. I also looked at various app review websites for some additional purchases. Little eLit is a great place to start. They have great information and a truly ridiculous amount of it. I also browsed though random "Free Apps of the Day" websites. For me, this proved to be a waste of time. I would usually download 1 or 2 each day, but only 1 of them made it into the final app rotation. There's usually a reason they're free. There are some really good free apps out there. You just have to sift through all the junk to find them. We made an initial app download of 48 apps. Some of these were free or discounted when we bought them, but others were full price. Once we did our bulk app purchase, I went through and personally played each game. I wanted to make sure the content was appropriate for our age range, and that the apps didn't have in-app purchases. I also checked each app to make sure it could be played horizontally. Since we wanted the iPads as secure as possible, we decided to permanently mount them horizontally. The biggest surprise to me was that two apps just completely didn't work! One wasn't compatible with our iPad 4 and the other was simply broken. Luckily, iTunes refunded our money completely on those. After all of the above, about 12 of the apps were not useful to us. Some couldn't be played horizontally, and some were just too hard for our target age range. Two we got refunds for, but the others were just lessons learned. Next, I made an app schedule for both branches and Main. I wanted our initial app purchase to last us until January, so I made sure apps didn't repeat on the same day of the week. That way a family who always came on Mondays would be getting a different app each week. Here is a list of the apps I downloaded with a short description on each one. The bold titles are ones that did not make it into the final rotation. Check back on Monday for what actually happened when we put all of our careful planning in action and unveiled the iPads to the public! We now have iPads in the Children's Room! You can find Part 2- all about pick apps- here. Part 3- all about the final details and improvements- here. It was a time-intensive project from start to finish. So, to make it easier for readers and myself, I'm going to divide this into three sections– Planning, Picking Apps, and Final Steps. Hopefully, these posts will make it easier for other libraries to implement iPads! I have to give many thanks to all of the wonderful people who helped me through this process. Kelsey over at Library Bonanza was a wonderful resource. Her blog post is full of fabulous information and she answered every single question I put in front of her. There were also numerous people I reached out to through list-servs. Thank you to everyone for all of your great answers and support! Deciding on which tablet to use was the easiest part of this process. I was familiar with iPads and after a little research decided they would give us the most return for our money. Plus, I asked a lot of the fabulous people in the library world what they had and almost everyone answered iPad. First, we had to decide how many iPads we realistically needed for our 3 libraries. All of our iPad money was raised through various community donors, so we had a very strict budget of what we could spend. 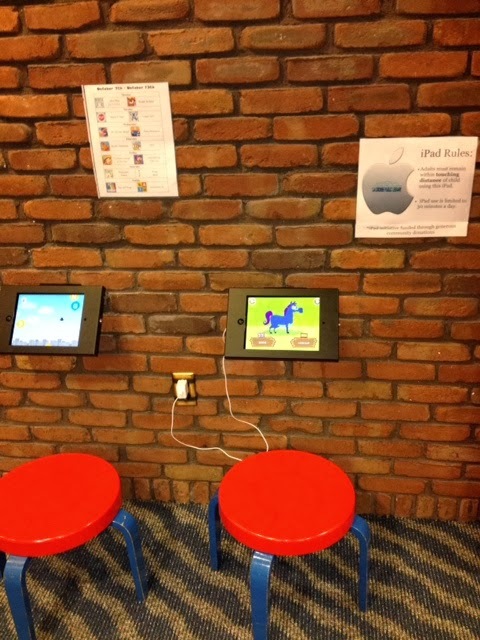 After looking at our space and resources, we decided to install 1 iPad at each branch and 2 at the Main location. Next, we had to decide on where to actually put the iPads. We wanted them to be within our line of sight, but we also didn't want to get 1,000 questions a day about them. We currently have AWE computers directly behind our desk and people immediately yell for help when they are stuck. I'm a big believer in self-guidance and didn't want to have the same issue with the iPads. We eventually decided to put the iPads directly in our Early Literacy Center. It is far enough away that we can't hear every word that is being said, but we still can see everything they're doing. Plus, one of our security cameras looks directly into the space. Finally, we had to decide on which display case to purchase. We knew we wanted them to be directly mounted on the wall, but we weren't sure about movement, security, etc. After asking about 15 different people, I chose to go with this one from Maclocks. It seemed to be the most durable, had the best reviews, and was reasonably priced. We also decided to purchase a heavy-duty screen protector. The thing about iPad stands is that they are all kind of awful. Almost every librarian I reached out to said, "We chose this one but it can be difficult/hard/impossible at times." We decided to just bite the bullet and hope for the best with our purchase. We were semi-successful. The stand is secure and mounts on the wall beautifully. However, the home button isn't really fully covered– little fingers can definitely still hit it. Plus, there was no cut-out for headphones. Luckily, our brave maintenance man drilled one for us that was just barely big enough to fit a Y-splitter in. We wanted each iPad to have 2 sets of headphones, since one of our main goals is to increase parent and child interaction. 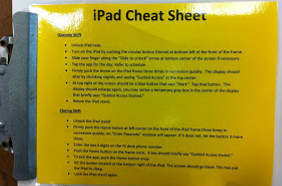 Check back on Thursday to see how I chose which apps to put on the iPads in the room!